Its the first of December, EEEEPPP!! This month you will see a whole range of festive posts, and every monday for the whole month I will be posting different 'Festive Nails'. I did this last year as well, feel free to check them out here hope you enjoy and hopefully I can remember to post every Monday! Today I am bringing you one of the polishes I have had for a while but haven't used before! This is BarryM's Rapsberry with Rose Gold Glitter on top and is the most beautiful combination I have ever seen, the colours work so well together and I wish that this polish was in gelly formula because it doesn't last as long! But never mind, still love it and have worn it for the the past week on my toes and fingers! 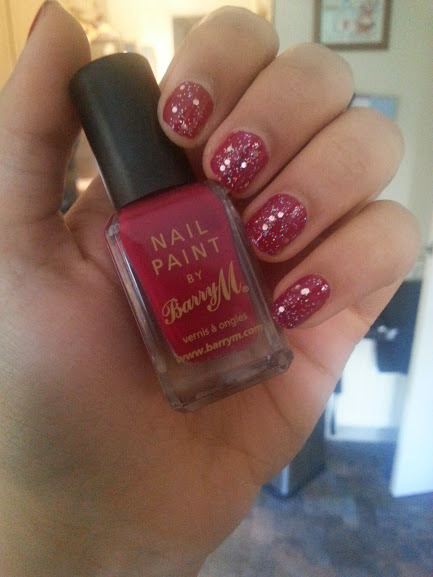 I've got Barry M Raspberry too, it's such a pretty colour - looks amazing with the glitter added on top!